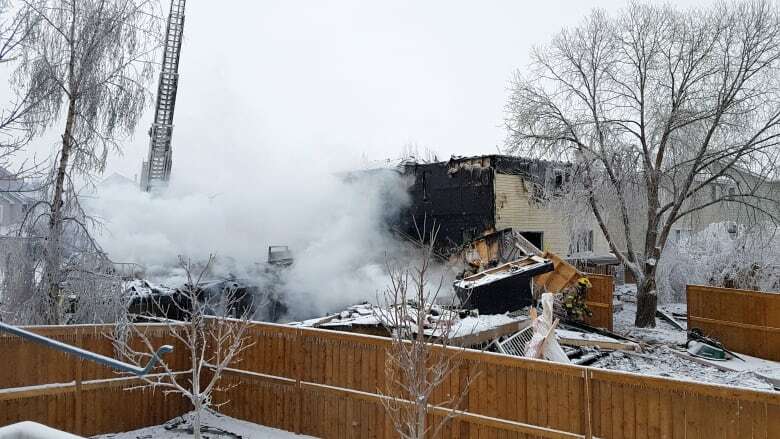 Calgary police say they’re not treating the death of a man whose body was found inside a house that exploded early Sunday morning as suspicious. Calgary police say they're not treating the death of a man whose body was found inside a house that exploded early Sunday morning as suspicious. Emergency crews responded to numerous 911 calls at about 4:20 a.m. when the house on the 300 block of Douglas Glen Close S.E. exploded and caught fire, with the spreading flames damaging adjacent homes. Strong winds and cold temperatures hampered efforts to get the flames under control. Police later confirmed that a man's body was recovered from the house that blew up. "The Calgary Police Service arson unit and CFD investigators have determined the explosion and fire was caused by human activity; however, the death of the man is not considered suspicious," police said in a release on Tuesday. The man, who has been tentatively identified as a resident of the house, was the only occupant. His name will not be released since his death is not considered criminal, police said. There were no injuries in the neighbouring houses.